Formed at Ringway from the Glider Exercise Unit on 25 January 1942, it was initially equipped with Hectors and Harts to tow Hotspur training gliders, which were taken to Netheravon in early February. In June Whitleys arrived and had replaced the biplanes by August. However, on 3 June the squadron was split in two with No 296A going to Hurn whilst 296B remained at Netheravon. On 12 August 1942, 296A at Hurn adopted the numberplate of 296, whilst 296B was redesignated as the Glider Pilot Exercise Unit and remained at Netheravon. The squadron began leaflet dropping operations in October but in February 1943, it re-equipped with Albemarles, which it then flew to Algeria to take part in the airborne element of Operation Husky, the invasion of Sicily, returning to the UK in October. It then began training and preparing for the next major airborne assault, that of Operation Overlord, the Normandy landings. For these it provided three pathfinder aircraft and eight towing Horsa gliders, with a further 19 gliders being towed in during D-Day itself. During the Arnham operation in September it towed 25 gliders in the first wave and a further 21 the following day and shortly after the squadron began converting to Halifax Vs but it was November before the final Albemarle left. Until the Rhine crossing of March 1945, the squadron carried out supply dropping missions to resistance forces in what remained of occupied Europe. With the end of the war the squadron was involved in trooping flights to Denmark and Norway and returning POWs. The squadron also began flights to India in December 1945 but on 23 January 1946 it disbanded at Earl's Colne. Formed at Netheravon from the Parachute Exercise Squadron on 22 January 1942, it received Whitleys the following moth and began training paratroops. In October it began leaflet dropping missions over the continent. Some Albemarles were received in July 1943 and by February 1944 these had completely replaced the Whitleys. Prior to the invasion of Normandy, the squadrons main activities involved supply dropping to resistance forces in occupied Europe. The squadron sent 24 aircraft to drop paratroops on the eve of the invasion and on D-Day itself, they flew another 20 loads. During the Arnhem operation in September the squadron towed 28 gliders to the aera on the first day and 24 more on the second day. Between Arnhem and its next major operation, Operation Varsity - the crossing of the Rhine, in March 1945, the squadron converted to Halifax IIIs. With the war in Europe over the squadron undertook trooping flights throughout Europe and from early 1946 the squadron became a transport support unit for the airborne forces. In September 1946 the squadron was reduced to cadre and then received the Halifax A Mk 9 in January 1947. In October 1948, the squadron moved to Dishforth without their Halifaxes and the following month re-equipped with the Hastings C Mk 1. Some of its trained crews were detached to Germany during the Berlin Airlift, where thy delivered coal into the city. On returning from Germany, the squadron moved base to Topcliffe but on 15 November 1950 the squadron was disbanded, many of its crews going to No 24 based at Lyneham. Originally formed on 24 August at Thruxton in the airborne forces role equipped with Whitleys, it was disbanded on 19 October the same year. With the build up for Operation Overlord getting well under way it became necessary to increase the number of airborne forces units in preparation for this and so the squadron was reformed on 4 November 1943 at Tarrant Rushton from 'A' Flight of No 295 Squadron. It began supply dropping operations in February 1944 as well as continuing with their training for the forthcoming invasion. Six aircraft operated on the night of 5/6 June 1944 towing gliders to capture the Orne bridges. The squadron towed a further 15 gliders to Normandy on D-Day itself. Its next major operation was the Arnhem operation in September when on the first day, it towed 13 Horsas and seven Hamilcar gliders followed by 8 Horsa and 8 Hamilcars the next day and 10 Horsas on the last day. In March 1945 the squadron towed 25 Horsas and six Hamilcars during Operation Varsity, the Rhine crossing. With the end of the war it began trooping flights to Denmark and Norway but in August, the squadron began moving out to India. Initially based at Raipur, it operated in the transport role, moving to Digri in December and Baroda in May 1946. 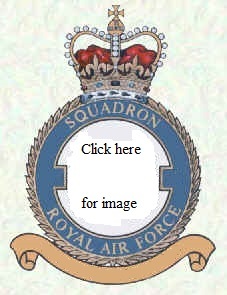 In July 1946 the squadron re-located to Mauripur and reverted to its original role, airborne forces support, but on 21 December 1946 the squadron disbanded. Formed at Stoney Cross on 4 November 1943 from 'C' Flight of No 297 Squadron, it was initially equipped with Venturas. New equipment arrived in January 1944 in the shape of Stirlings, with which it began training in the airborne forces role. Supply dropping operations to resistance forces in France began in April 1944. On the night of 5/6 June it despatched 24 aircraft to drop paratroops and then during the day 16 towing sorties were carried out, two aircraft being lost. Until its next major airborne operation, Arnhem, the squadron continued its supply dropping missions. During the first three days of the Arnhem operation the squadron carried out 54 glider towing sorties and during the rest of the operation carried out a further 72 re-supply sorties, five aircraft being lost. During Operation Varsity, the crossing of the Rhine in March 1945, the squadron despatched 29 sorties. The squadrons final wartime operation was to take troops to Norway after which it reverted to normal transport duties until disbanding at Shepherd's Grove on 15 February 1946.